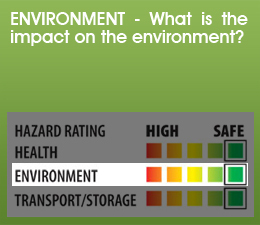 The Envirosafe Solutions product rating has been developed to assist the buyer with a quick reliable reference for choosing an effective product that will be safe for the user and the environment. The management team at Envirosafe Solutions have placed a heavy emphasis on offering products that are not only very effective but safe to use, have a low impact on the environment and are safe to transport and store. The many issues associated with the use of toxic chemicals used in a vast range of products are coming to light, and slowly we are beginning to appreciate that there is in fact considerable long term harm that results from the use of these products. 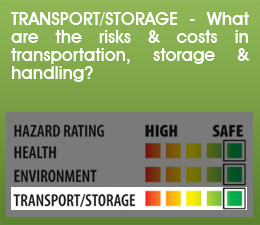 These are what I would term the hidden costs- costs in terms of damage to the environment; health-related costs, both to us as individuals and to companies in the form of lost time as a result of injury/illness; and finally the costs involved in the storage and transport of dangerous goods, which are huge ? unfortunately many buyers do not take these issues into consideration when making a purchasing decision. I would strongly urge you to consider the hidden costs of these usually toxic and often misrepresented as 'cheap(er)' products, which invariably they are not when you consider all the factors. At best they are cost comparable with ours on face value; however, most of our clients are pleasantly surprised when they find out the prices in our range of non-toxic products are competitive with what they are using now, not to mention their astonishment at how effective they are! 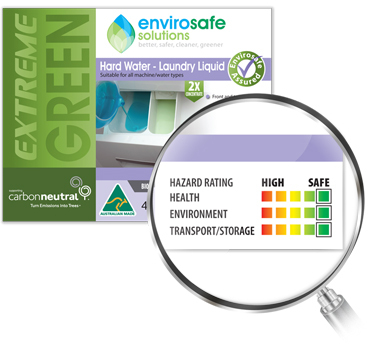 Envirosafe Solutions extreme green product range is manufactured under licence to strict guidelines and the Envirosafe rating is determined in concert with the manufacturer's independent chemist. The proprietary 'Envirosafe Rating' is derived from Worksafe WA technical data sheets/MSDS and the relevant standards. With the manufacturer's chemist's guidance a set of grades have been derived that describe each product in terms of its capacity to cause harm/or not to cause harm in this case. 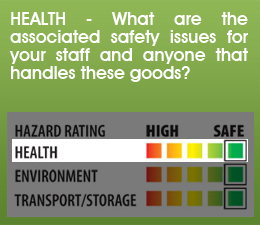 The 'Envirosafe Rating' was designed to assist you, the busy professional, in choosing the right product with respect to the three areas most commonly impacted by the use & handling of industrial and potentially harmful compounds. This rating system provides a quick 'ready reckoner' to assess the impact (or lack thereof, in our case) of our products in these main areas of concern. The Envirosafe Solutions? website also illustrates where each product sits in terms of OHS & Environmental impact compared to common generic products in the same category ? have a look, you may well be surprised. We hope that this system assists you in determining if our products are healthier for you, your staff and the environment. We would love any feedback you have on our system and we are always striving to improve it.